A woman in West Valley City, Utah was shocked to find four abandoned Chihuahuas in a box on top of her car on Tuesday. The box had “free, mama passed away” scribbled on it and a note saying the puppies were born on Friday. Knowing she needed to act fast, the woman rushed them to the Humane Society of Utah. 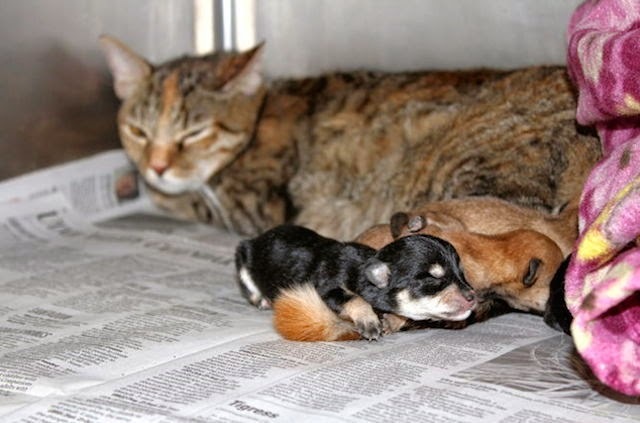 They put the puppies in a room with a cat that had recently been dropped off at the shelter with her pregnant sister. Deann Shepherd, director of communications for the Humane Society says it’s a lucky thing the woman brought the puppies in when she did because they may have perished in a few hours having gone so long without food. It was also lucky that the pregnant cat brought in was lactating and could nurse the puppies. 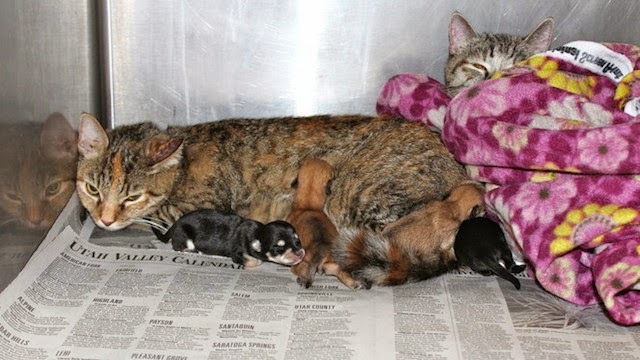 "We decided to try to put the puppies with the cat and see if they would nurse," Shepherd said. "We didn't know how long they had been in the box on the car, how long they had been without their mother, and luckily they did get some milk from the cat and she became kind of a surrogate mother to them." That lasted a short while, but because the cat went into labor and was dealing with the stress of the new environment, volunteers took over to bottle feeding the babies. For now the puppies are feeding and doing well. The staff are optimistic and are looking for a foster volunteer who can take them home and look after them. "We're lucky the woman found the puppies when she did and brought them to us, and we're lucky that we had a cat here that was able to provide some milk. We think that might have saved their lives," Shepherd said. Responses to "Newborn Puppies Abandoned In A Box Saved By Cat (Video)"